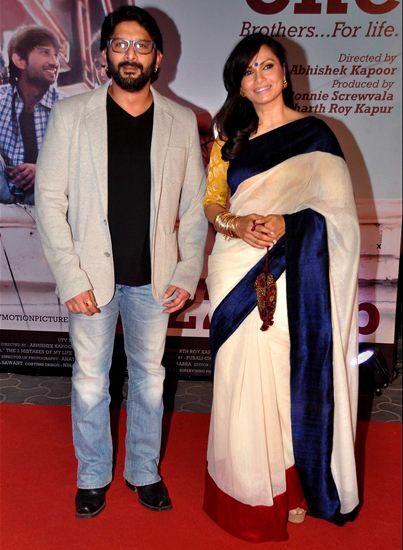 Vogue’s best dressed Sari Special showed some of the finest sarees worn by Bollywood celebrities. A lot of celebrities have chosen to wear saree over gown this year. Here is a collection of some of the most amazing sarees from celebrities like Vidya Balan, Chitraganda Singh etc. In the very first picture we find Chitraganda Singh wearing a brown golden colored Gaurang saree along with a white beaded necklace keeping it simple and pretty. 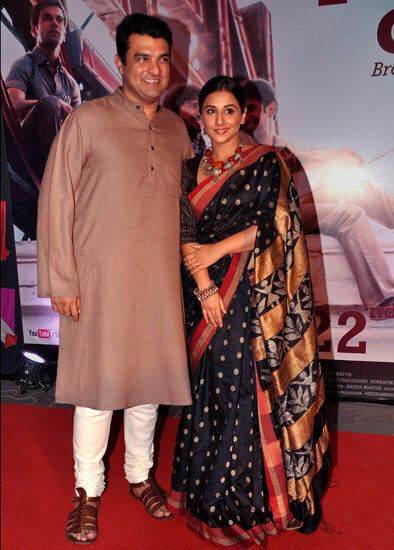 Next in line of pretty sarees is none other than Vidya Balan. She is known for sarees and traditional dresses, here you can see her wearing a black colored dotted saree along with a necklace and a choora in hand it is a traditional silk six yard staples by Kolkata designer. You won’t see Prachi Desai wearing a saree that often but here she is in this rare collection with a white colored dhoti style saree designed by Shruti Sancheti. Giving a look of a young student with specs and two pony tails, she is wearing a long full sleeved blouse as well. Keeping her height in mind this saree looks elegant on her. Next in line of pretty sarees is Maria Goretti Warsi she is the wife of Arshad Warsi she usually refrains herself from limelight but looking at her nice white colored saree you can say she has defeated most of the celebrities. The designer saree has been made by Payal Singhal. The saree is in white shade along with a dark blue colored thick border and red shade at the bottom edge, she is wearing traditional bangles and blouse of a golden yellow shade, her hairstyle matches with her dress. Kangna Ranaut is another celeb whom you will often find in pretty traditional dresses, if you see her movie Tanu weds Manu you will find some of the most elegant dresses worn by her. Here she is wearing a green colored saree with black prints, giving contrast to it is a black colored blouse and black bangles, her curly hairs and golden necklace is adding glow to her style. She is wearing the saree in the native way. Simone Singh in a silky greyish shade of Saree a long pallu and a white bag in hand adding glow to her looks are the earrings and low sleeved blouse not to mention her beautiful smile as well. Mini Mathur the famous TV anchor from Indian Idol and other talent shows, is next in the list of celebs with pretty sarees. She is wearing a yellow colored saree with half blue shade at the bottom and borders of golden and red color. Overall a nice saree with purple blouse. How can you forget the fitness celeb Mandira Bedi, she is here in reddish pink colored saree, with borders of golden yellow and pink shade. Her blouse off shoulder with no sleeves and her pretty smile makes her look more enthralling. Priyanka Chopra our favourite desi girl who also happens to be the ex miss world is known wear some of the best looking dresses. Here she is in white Georgette saree, with net like cloth there is a good amount of embroidery on the dress with sleeveless blouse in pinkish shade. Our list of best dressed sari celebs was not over until we add Kajol in the list, she is wearing a golden colored sari by Sabyasachi with green full sleeve blouse. A nice dress for formal occasions like marriages. Here is Shilpa Shetty in elegant white colored saree with pink emroidery on her pallu. She is keeping it simple but pretty. She is on the sets of Nach Baliye 5. Coming up next is Sridevi probably one of the few actresses who really made sarees famous. Here she is in golden and white shaded dusky saree with heavy border and a black colored blouse. Manish Malhotra has always made the celebs look amazing in his dresses here is one of his outstanding collections worn by Esha Gupta. A merger of red and black with heavy embroidered border. Her open hairstyle adds to her looks. She is using black colored nailpolish and match earrings. A few more amazing sarees one by Priyanka Chorpa in yellow and red shade with sleeveless blouse made by Manish Malhotra. Next is Aditi Rao in silver colored saree with sleeveless blouse and curled hairs dress by Gaurav Gupta.